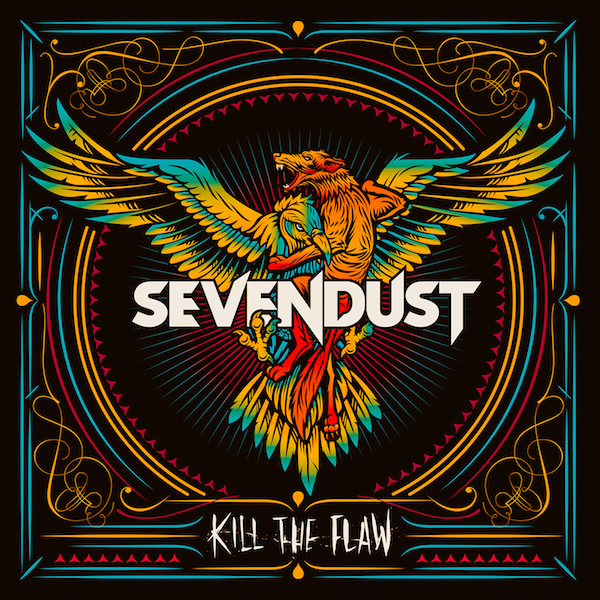 On October 2, 2015, Atlanta alternative rock group, Sevendust, will release their 11th studio album entitled Kill The Flaw. While I’m not long-time fan, I do remember jamming out to the album Next in my best friend’s Honda Civic following its release nearly 10 years to this day. I also distinctly remember telling myself that I should pick up their 2010 release, Cold Day Memory, shortly after it had come out, only to fail to do so. Somehow it just seemed appropriate, when the opportunity to check out the new album came across my plate, that I should tell everyone how awesome it is in order to make up for that previous failure. And I assure you, it is awesome. I can’t offer anyone a comparison to past albums, with the exception of saying that the production on Kill The Flaw is far more polished than Next, but that’s to be expected from an album that has the benefit of arriving a decade after the other. What I can offer is the pleasure of knowing that this is not simply a collection of a few great songs in a batch of lemons. Each track steps up the plate with the intent of knocking your expectations out of the park and not a single one strikes out. Now, I surely have my favorites, which I’ll touch on shortly, but from the opening track, “Thank You,” until the closer, “Torched,” this quintet is relentless in its efforts. This is my first Sevendust experience with original guitarist, Clint Lowery, in the fold. I was already familiar with him from his work with his brother’s (Corey Lowery) band, Eye Empire, to which he contributed compositions, as well as his role as guitarist for Walking With Giants. In fact, vocalist Lajon Witherspoon and drummer Morgan Rose contributed to the former’s debut release as well, but I’m beginning to digress. Kill The Flaw is an alt. rock behemoth, armed with a concoction of chunking riffs, dissonance and melody, not to mention a tacklebox of hooks. It’s difficult for me to even narrow down what to tell you about, but at this exact moment Lowery is surfing through my ear canal with the melodious-turned-explosive solo of “Forget.” Shortly thereafter, Witherspoon’s voice cascades over that same eardrum with the opening lines of “Letters,” which is as intense as it is emotional, as powerful as it is gentle. On the rest of the album we find piano lead-ins to bone-crunching riffs (“Cease And Desist”), acoustic steel-string goodness with a Southern twang (“Chop”), and just a few moments here and there that bring to mind Static-X, such as haunting, suddenly manifesting screams during “Peace And Destruction.” But let’s go back to “Chop” for a moment, because this has to be my favorite song off the album. There is so much going right here that I can’t figure out, for the life of me, why it wasn’t one of the singles released to promote the record. From the Southern steel-string that winds back and forth with pummeling electric riffs and the soaring vocals, this song just POPS! The Southern-tinged atmosphere adds a down-to-Earth quality, while little touches like the rapid-fire rhythm lick behind the chorus just take it to another level. Not to mention, this track has a contagious groove that permeates through the rest of the album as well. Sevendust has been releasing albums for the last 18 years and, while I’m not a fan of smoking, this album certainly seems to be lit. From the very first notes until the sound has faded from my ears, I’ve been hooked on this record. If this is what I’ve been missing over the last 10 years then I have some catching up to do. Kill The Flaw finds the band in top form, with no signs of slowing down or running out of things to sing about or pummel into dust. And it certainly sounds like they’re having a blast doing it!